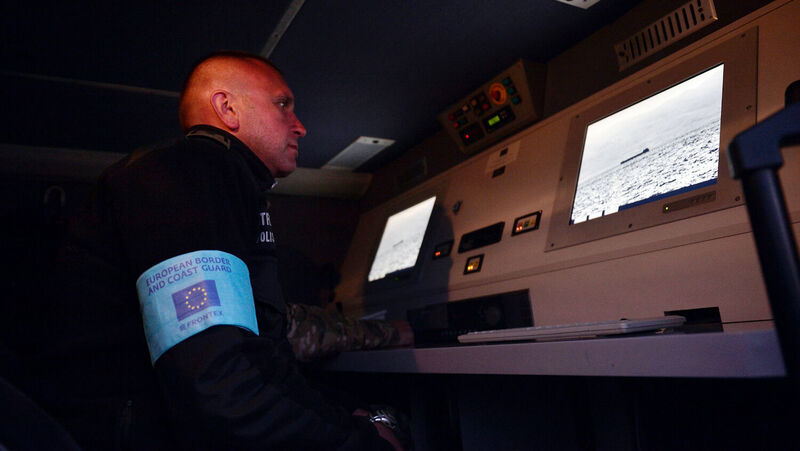 Polish border guards serve at the European Border and Coast Guard Agency on March 28. The European Commission wants to dramatically expand the European Border and Coast Guard Agency, according to initial budget proposals released May 2. The European Union launched the force in October 2016, and it is currently 1,500 strong. It can send in its soldiers, even if the country they’re going to does not want the deployment. EU nations are giving up the legal right to have a monopoly of force within their own borders. For the first time, there will be a pan-European military force with the right to go anywhere it wants within the Union. Now that this border force has been created, ramping it up later would not be too difficult. Details are sparse and won’t be revealed until mid next month. But clues in the terminology “standing corps” would suggest that the plan is to create [the] European border guard force within Frontex. Frontex is the organization that became the border agency in 2016. Currently, the 1,500 border force is made up of border guards on loan from various countries. The outline of the Commission’s plans implies something more permanent. The Commission also wants to almost triple Frontex’s budget—the biggest increase to any item in the budget. So Europe is on track to have a 10,000-armed force it can deploy anywhere within its borders, even without the target nation’s approval. That looks pretty similar to an EU military. Of course, this force won’t have anything remotely like battleships, tanks and fighter jets. But creating this force is another major step toward creating a military. Europe is heading toward a military through a series of small steps. The German Army has absorbed most of the Dutch Army and is swallowing up substantial parts of Czech’s and Romania’s armies. It has created an EU military headquarters, albeit one only allowed to command training missions. These are small beginnings. But, as I noted last year, “the precedent has been set, and issuing a combat authorization or expanding staff—even drastically—is easier than establishing it in the first place.” We’re seeing this already with the coastguard force. Europe has huge power potential. America is pressuring Germany to spend 2 percent of its gross domestic product on its military. If Germany follows through, it will have a military budget much larger than Russia’s. Start combining that with other nations and you have a force to be reckoned with. The EU has an economy roughly the same size as America’s. France is already a nuclear power. The Netherlands, Germany and Italy each house American nuclear bombs. Mr. Armstrong based his prophecies on scriptures in Daniel 2 and 7 and Revelation 13 and 17. These describe a European power comprised of 10 nations or groups of nations that would appear in this end time. Revelation 17 says that these kings have “one mind” (verse 13) and shall “make war” (verse 14).